This has been a pretty rough week. On Monday, after a week of feeling just so-so, I came down with the full-blown flu. I know this because I went to the doctor where they stuck a swab all the way up my nose and apparently took some sort of DNA sample directly from my brain which they tested and it told them that I had the flu. So it was that I was forced to not snuggle the babies for about 36 hours until I was able to maintain no fever for over 24 hours. Then it was full on baby-snuggling time. Elliott may have looked like he hardly remembered me but it was a glorious moment to be reunited with the Wombats and to not need to use hand sanitizer or wear a surgical face mask. A lot can change over the course of a work week. 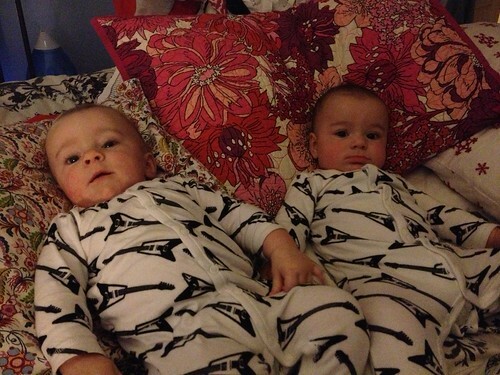 The boys seemed to finally reach the end of the line with their six month clothes. They are starting to resemble plump little sausages ready to burst out of their casing whenever we manage to cram them into any six month clothes these days. Last night, after a fair amount of coaxing, I was able to get Martin to go to sleep before Jen returned home from work. 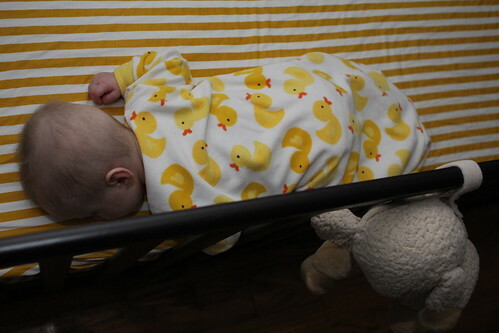 The result was him finding a new sleeping position which is on his stomach, pressed up against the absolute edge of the crib and snoring. This doesn't seem to be all that comfortable a position to me but this is the position he held for ten straight hours without moving an inch. 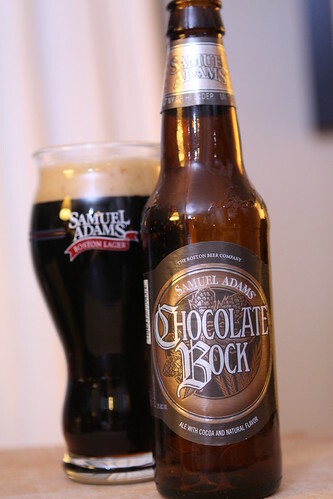 In between checks to make sure Martin was still breathing I poured myself this Chocolate Bock from Sam Adams. It was light, chocolatey, slightly acidic, and sure to make my father-in-law cringe. It's everything I could have wanted in a beer last night. 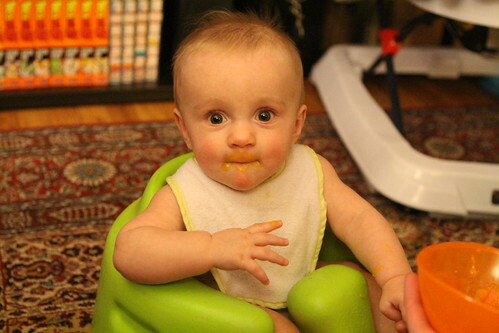 Tonight we gave the Wombats their first taste of butternut squash. 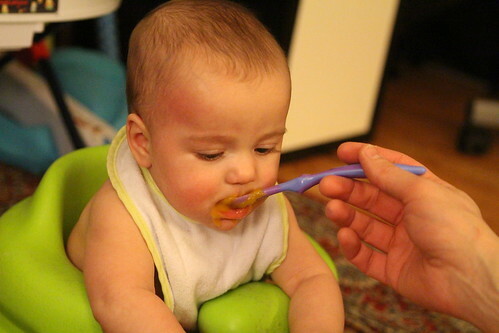 I had boiled and pureed some last night after dinner and it went over quite well. Since I'm a fan of lists I'm going to start keeping track of how much they seem to enjoy the foods we're making for them. It's something that only I would be interested in but that's the only reason I ever really do anything. 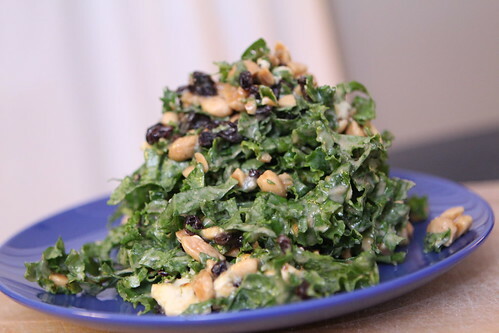 While Jen did the bedtime dance with Martin I put together a salad with kale, Marcona almonds, St. Agur cheese, and currants. I made a dressing with fig spread, sesame, tahini, and red wine vinegar. For the main course I boiled some sweet pea raviolis Jen brought home from Murray's Cheese. 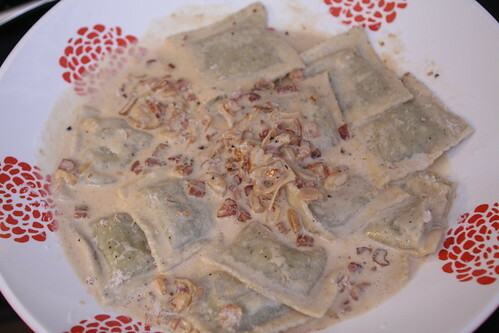 I made a sauce with rendered bacon, butter, shallots, cream, salt, pepper, and Parmigiano-Reggiano. This mostly just used up things in the fridge that were nearing the end of their useful life, however, it was also delicious. For beer I stumbled upon this gem a couple months back on my winter-beer scavenging trip. It was the N'ice Chouffe from Brasserie Achouffe in Belgium. This is a yearly release from them but my eagle eye spotted the difference on the label and I picked this one out on the shelf which was somehow leftover from 2010. The beer store was kind enough to do the aging for me. 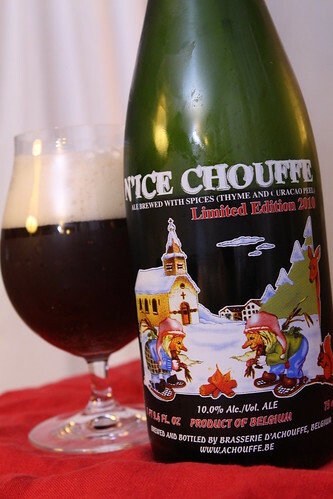 The result was a slightly mellowed version of the N'ice Chouffe. It had a cheesy-yeasty flavor, heavy malt, and high alcohol content. Strangely, after two glasses, I hadn't really felt the affect of the alcohol at all. Instead I was merely marveling at my love of gnome-themed Belgian ales. After a week Jen is now sick and so to are the Womabts. Well, presumably they are sick. Their noses are leaking like wide-open faucets. You wouldn't know that they are sick by their attitudes as they both seem to be having the times of their lives. I guess if I could poop and pee my pants, have people bathe me, and sleep whenever I damned well pleased it would take a lot more than the flu to get me down. Man their lives are so sweet!